Here are six cocktails that will, potentially, help you get what you want—especially if what you want is a fun party. When I was about 10 years old, I made a love potion for the annual science fair (my free-thinking school had a very loose definition of science). It required multiple trips to Rosemary’s Garden, the local herb store in my hometown, as well as quite a few different recitations and a bottle of nonalcoholic wine (the recipe called for real wine, but my mother advised against it). It was a serious undertaking. And while the potion did work (about a year later, after I’d lost interest in the target), I’ve now discovered that all that trouble was unnecessary. According to Cunningham’s Encyclopedia of Wicca in the Kitchen, pantry and liquor cabinet staples can be just as affective as mugwort, damiana leaves and other herbs regularly used in classic potions. Chives, for example, are good for protection, while avocados can help make you more beautiful. I could recommend a few spiritually beneficial salads or lucky pies, but what’s the fun in that? Instead, here are six cocktails that will, potentially, help you get what you want—especially if what you want is a fun party. Active Ingredient: Anise-flavored Pernod will help you cleanse your spiritual aura. It’s also delicious with plum puree and Champagne. Active Ingredient: The tequila in this seasonal take on a margarita enhances sexual desire. 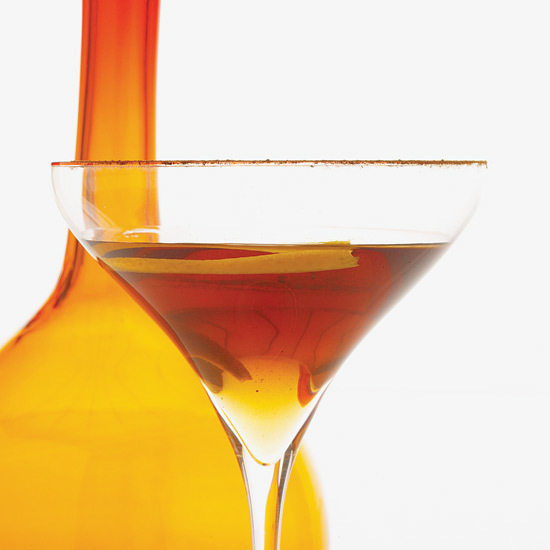 Active Ingredient: Kümmel, a caraway-flavored liqueur, is used to improve health. It’s important to visualize your fitness goal while sipping this sparkling, aromatic cocktail. Active Ingredient: Drinking blackberry brandy could help you come into some money. The best way to spend it? To buy more Champagne for this fruity, fun drink. Active Ingredient: The chocolate in crème de cacao encourages people to give or receive love. Visualization is also important here—envision your desired outcome while you drink. Halloween bonus: This cocktail was created to taste a bit like a Tootsie Roll. Active Ingredient: Rum is often used in modern voodoo rituals for protection against evil forces and entities. In this classic cocktail it’s paired with spicy ginger beer.